Ship tattoo was once a trendy choice among the sailors. But today, they represent a much larger group of people. If you have any connection with the sea or the boats, this type of tattoo is a perfect option for you. There are many different types of ships so that you can choose from a vast variety. If you want to get a ship on your body, keep reading – we gathered a beautiful collection of these tattoos. Ship and flower tattoo on the right hip and thigh. Ship and boat tattoos have several meanings. Apart from the clear associations with the sailing and sea, these tattoos also have other symbols. Let’s take a closer look at those. The sailors used to get a ship tattoo only when they crossed the Cape Horn, one of the most dangerous sea crossings. So, the ship symbolizes overcoming the difficulties. Therefore, if you had dealt with a severe problem in your life, this is an ideal choice for you. Adventures are another symbol of the boats. The sailors used the boats to discover and conquer new territories. But they did that without any guarantee that they will return home. Also, many of them have lost and died in the seas, so it can also be a sign of respect for them. The ship must face the difficulties of the sea: the storms, the winds, and the huge waves. So, it is also a symbol of strength and resistance. Returning home is another symbolic theme of the ship tattoos. It may also represent a return home or to your origins after a long search for yourself or a great trip. A sign of luck. Tattoos of ships and anchors are the amulets for the sailors. They protect them from the dangers of the sea and help them to return safely back to their homes. There are many different types of ships, so you have a wide variety of choices here. 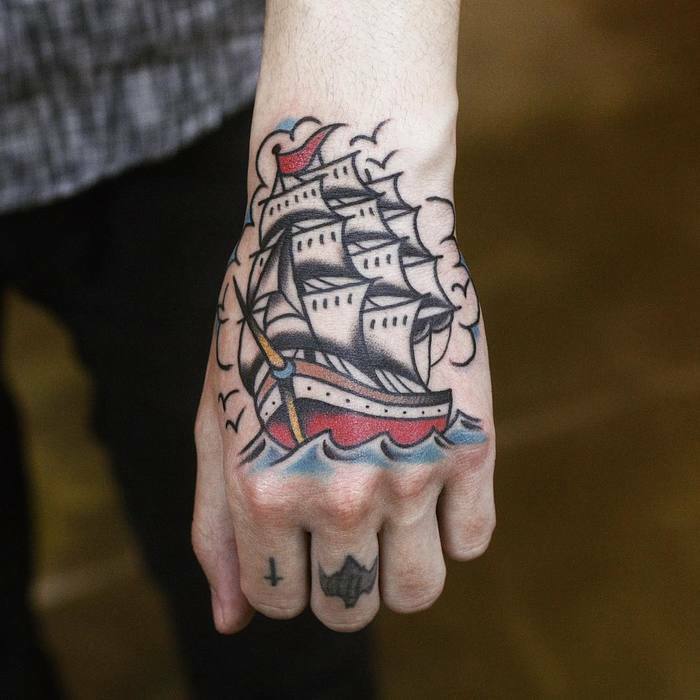 Although, the most popular style of ship tattoos are the traditional brigantine ships. The modern ship types such as yachts and huge warships are less popular. 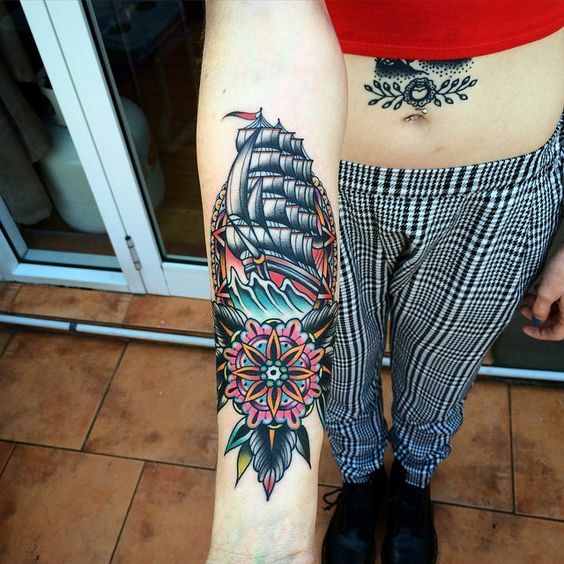 However, we can see the rising popularity of small and minimal ship tattoos among the ladies. Regarding the size of the ship tattoos, we recommend mid-size or larger pieces. Mainly because with the smaller designs you will have to sacrifice many details. 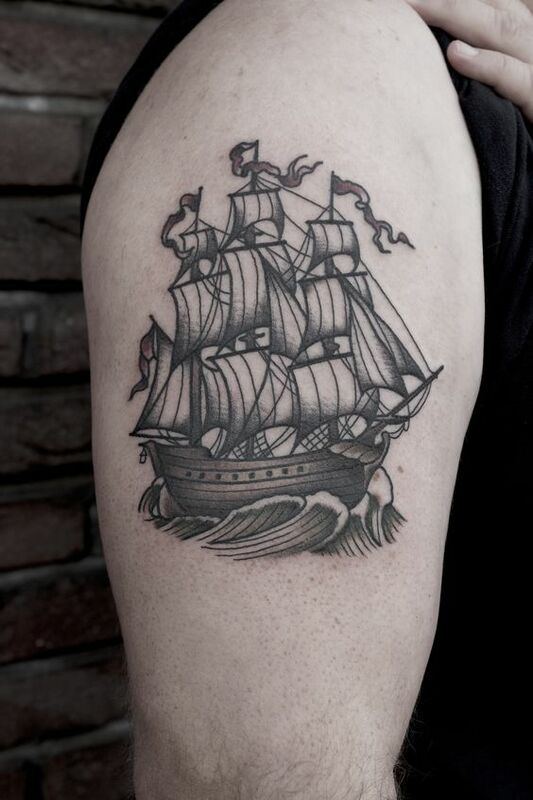 It’s okay if you want a tiny symbol of the ship, but if you want it to have the sails and other things, you should go with the bigger tattoos. To feel the beauty of the ship tattoos, you have to see them yourself. That’s why we leave you with the best ideas below. Take a look, and we are sure you will find your dream tattoo!